The haunted houses in Colorado can be a frightening experience at Halloween time. Funtober lists the best 2018 haunts featuring haunted houses, haunted trails, haunted corn mazes, and haunted hayrides. Each October Halloween brings scary entertainment to Colorado. Our list below has lots of demons, zombies, creatures, and monsters named Freddy and Jason to terrify you. Enjoy an October night out with your friends at a local scream park. So if you must go to a Colorado haunted house in 2018, park your vehicle close, leave the doors unlocked, and prepare to flee quickly! Zombies are everywhere. We have separate attraction links and listings for haunted houses USA, haunted corn mazes, haunted trails, haunted zombie paintball, haunted forests, haunted hayrides, and ghost tours. Depending on the night, doors open between 7:00 pm – 7:30 pm and close between 10:30 pm and Midnight. Please double check their website for official dates and times. General Admission ticket prices vary depending on the date. Mark your calendars because they also run blackout nights. Expect to be terrified as your worst fears come to life in the 13th Floor. The Asylum and 13th Floor are within a 3.5 mile area. You can purchase combo tickets that will get you into all attractions for a full evening of terror. This is one amazing haunted attraction. 13th Floor has over 94000 Facebook likes. Opens weekends on September 21st and nearly every night in October. For those who live west of Pueblo or south of Colorado Springs, there a great haunt in Canon City. Aftermath Haunted House runs on three Saturdays beginning October 13th and Friday October 26th. Classic Halloween characters come to life at the Cañon City Recreation and Park District’s “Aftermath.” Come and witness the horror and darkness of Halloween like never before as you tour the property to the east of the Recreation District. Keep an eye out for terror at every turn; after all, they have already been watching you. It will run from 8 pm to midnight each evening. All proceeds will benefit Recreation District programs. Any child under 12 must be accompanied by an adult and have parent permission. The Asylum is one of the scariest and most popular haunt attractions in the country. Damp, musty and infected with the screams of tortured souls make it an exhilarating attraction. Make sure you don’t lose your head, or your mind, when entering the Asylum Haunted House. It features a 15,000 square foot haunt whose theme is a mental hospital for the insane; when purchasing an Asylum ticket, you will also get access to Primitive Fear. General Admission ticket prices vary depending on the night. Doors open after 7:00 pm. Please double check the website for official dates and times. They also have a combo available with their sister haunt 13th Floor. The Asylum has over 36000 Facebook likes. Frightening residents of the Henderson area, City of the Dead Haunted House is located at the Mile High Flea Market. Legend has the City of Dead existing beneath the mile high city featuring relentless and hungry zombies. The attractions are Carnival of Carnage, City of the Dead and Curse of Darkness. Carnival is advertised as Denver’s largest haunt. Expect to find 30 themed scenes. It is open from 7 pm to 12 am on Friday and Saturday but closes at 11 pm all other nights. Ticket prices vary online for this 3 house feature haunt attraction. They also have food, Pepsi products and serve Coors light products. Curse of Slaughterhouse Gultch and THE 13TH DOOR HAUNTED HOUSE are next door door to each other and have the same owner. They will not open in 2018. They are very proud of their highly detail haunt set designs. Check their webpage for more details and videos. I believe they are open October 26th and 31st. The theme park converts for Halloween starting on September 28th. Elitch Fright Fest consists of four haunted houses located on the grounds of the Elitch Gardens theme park. Elitch is family by day and fright by night. It is open every Friday, Saturday, and Sunday nights in October. The park has a science lab that works with radioactive materials. Test creatures have escaped and are roaming the grounds. Save money on Elitch Gardens tickets and buy online for savings. The attractions include Ghouls motel, Scream it out, Trick or Treat trail, Vulture, Hay Maze, Hurl, The Awakening, and Freak Show. They also have three very scary attractions called Flesh Factory, Terror Chamber, and Séance for a separate Fright pass. Open every Friday, Saturday, and Sunday nights beginning October 12th. The Empty Grave is a fully themed immersive Haunted Attraction located in Longmont, CO. Now celebrating their 13th year. The Empty Grave invites you to work a night on the Graveyard Shift. Now located at the Village at the Peaks Mall (between the Regal Cinema and Party City). This experience is worth a trip up the mountain to the small town that is known for its ghostly legends! The 4th annual Haunted House at American Legion Post 119 gets better every year. Tour the basement maze of horrors in this historic icon at the corner of Highways 7 and 36 in Estes Park. Open every Friday and Saturday night 7-10pm from October 12th. Cost of $15 includes the Haunted House tour and carnival games in the Legion Hall. Refreshments are available. Proceeds benefit American Legion programs in support of veterans and their families. Opens September 21st at the all new Colorado Springs Event Center location. Hellscream Entertainment presents the all new Haunted Mines! Bigger, darker, and more terrifying than ever. This Halloween season, experience the Haunted Mines like you’ve never seen it before, with a mix of old and new in store! Explore your deepest fears, and decend into the darkness at the new location at Palmer Park and Academy. Open most Thursday through Sunday nights in October. Check web page for schedule details. Tickets are $22. Monsters, zombies, and more come out, with new experiences to scare you. Tickets are $5 for everyone. Open October 29th, 30th, and 31st. The fear begins this year on October 5th. Hell’s Trail is almost one mile of sheer terror. Beware of the scary clown. It operates Friday and Saturday night from 7 pm to 12 am or other nights until 10:00 pm. Tickets are around $10. Season begins on September 22nd. Now open for 10 years, Hellscream Haunted House features 3 attractions in 15,000 square feet of space. Last year they moved into their new multi story building. As the former home of a mental health facility it was certified haunted by the Rocky Mountain Research, Investigation of the Paranormal and Photography group. Owners took their talents in the movie and television industry to create a cutting edge in your face haunt. View never seen before animatronics, special light and sound effects and extremely talented live actors. Even bigger and better scenes than last year. The 3 attractions are The Dungeon of Despair, VonHellton’s House of Horrors, and the Screamatorium. Come visit the most insane haunted experience of your life, if you dare! Hours: Friday and Saturday 7:00pm – 11:00pm. Open all other nights 7:00 pm – 11:00pm. Attraction runs Thursday through Sunday most nights in October. The fun begins on September 29th. Located at Flat Acres Farms this attraction is an amazing haunted field walk through. What lurks out in that field? Expect to be scared. Doors are open from 7 pm until 10 pm. This year they also feature the Dead End Motel and their new attraction Goblins Grove. Get all haunts for one low $30 combo price. Located near Target and Walmart in Parker. Open Friday and Saturday nights in October plus a few added dates. Reinke Brothers Haunted Mansion is re-opening its doors after a three year hiatus!! This year the 50 year old family tradition continues! Come back and enjoy what families and haunted house enthusiasts have loved and talked about for years. The Haunted Mansion has even more chills and thrills then ever before. Don’t miss the grand re-opening of Reinke Brothers Haunted Mansion this September. 28 thru October. 31, 2018. Be sure to join us on September. 29 for our grand re-opening festivities. It will include the Haunted Mansion, Big Wonderful, free concert, food trucks and vendors! Fritzler Farms operates Scream Acres. They operate daytime non scary corn mazes with haunting activities starting after 6 pm nightly. Friday’s it runs from 5 pm until 10 pm. Saturdays from 11 am until 10 pm. Wednesday and Thursday hours are 5 pm until 9 pm. Sunday hours are noon until 6 pm for a non scary attraction. A combo ticket exists for the haunted corn maze, pillow jump, slide, pumpkin cannon, corn cannon, and regular corn maze. They also have zombie paintball. It opens September 28th and runs most Wednesday through Saturday nights in October. Opens September 21st. Terror might be my favorite fright entertainment haunt in Colorado. It is located on the Anderson Farm that during the day operates a fall festival featuring a mine car ride, spider web, tire mountain, corn maze, farm animals, pumpkin launcher, a general store and a concession stand. Anderson Farms at night runs Terror in the Corn witch has a Haunted Hayride, Ghost Town, Haunted Trail and Zombie Paintball Haunt. Expect to find ghoulish creatures, chainsaws, and snakes. The haunts are open on Friday, Saturday and Sunday nights in October plus some added dates..
Frightmare consists of two haunted houses at the same location at 108th and Wadsworth Blvd. in Westminster: Frightmare and The House of Darkness. Doors open at 7 pm and close on Friday and Saturday at 12 am or all other nights at 10 pm. The compound has an abandoned fun house that was moved here following a carnival massacre. Spirits of the undead have returned with flesh eating clowns trolling for demented fun. Also come prepared to play their fantastic Zombie Paintball. Opens on September 28th weekend. Runs every night from October 3rd through October 31st. This amazing haunt has over 99000 Facebook likes. (Separate but co-located with 13th Floor attraction.) The Undead: Possession replicates an actual farm house under siege by the walking dead. Experience Zombie’s like never before. Doors open between 7 to 7:30 pm nightly. Doors close at various times from 10:30 pm until midnight so check the schedule for the night. The Asylum, 13th Floor, and Undead are all with a 3.5 mile area. A combo ticket gets you into all the attractions for a full evening of terror. Some times, the nearest haunted house to you may be across the state line of Colorado. If you reside by the boundary with another state, or that is where the closest big city is, there should be a haunted house that is worth considering there. So in addition to the Colorado haunted houses, I’ve identified these border states with haunted attractions for you to also consider. Have you been to one of these haunted houses? Future readers would love to hear what you thought. Did you have a good time? Was it worth the price? Would you recommend it to others? Any suggestions to maximize your experience? I’ll gladly publish what you send me and give you a great big hug. An annual Halloween tradition continues this October at the Dao House with our Belgian Draft Horse teams: Rosie and Rusty, and Cody and Toby. Take a chilling ride through the haunted woods during the two weekends prior to Halloween on a creepy horse-drawn wagon. You will encounter ghastly characters and frightening ghouls that only come out at night to seek nourishment from your terror! The ride keeps you on the edge of your seat while you hear hair-raising sounds in the far dark, but beware: you may faint into the hands of the unknown! We suggest the early ride for those with young children. It is less scary for the youngsters, since not as many goblins come out during the daylight hours. Not until complete darkness descends upon the land will the true ghouls make their way through the pitiless forest in search of the curious and foolhardy! Come ride the haunted wagon on October 22nd and 29th. Rides are at 6:30 p.m., 7:15 p.m., and 8:00 p.m. Limited seating, reservations are required, call 970-586-4094 x1. Adults $30 | Kids (4-11) $20. Held at Dao House, 6120 Hwy. 7 Estes Park, CO 80517. With indoor activities, get your first spooks and screams with a scary movie, listen to monstrous and mysterious sounds and discover skeletons throughout! 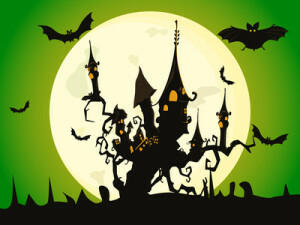 Tricks and treats, witches’ brew and ghoulish snacks will be served and available for purchase. Seating is limited, reserve your scare early. Ride at your own risk!